Many agents will make recommendations about ways to remove clutter or depersonalize your home. Some will even suggest that a professional home stager be brought in to completely maximize the space and create a setting maximizes the buyer’s ability to visualize their own things. The key thing to remember here is these suggestions are not personal and you may have to be a little uncomfortable so that your house puts it’s best foot forward. Most agents aren’t going to be this blunt. But in some cases, they wish they could be. They’ll take a more tactical approach and say something like…..’during the time your house is on the market, it might be a good idea to smoke outside’. But what they know is that nothing will stop a potential buyer in their tracks faster than a strong odor of any sort. In some cases, this could just be the leftover smell from last nights dinner. In more extreme cases, agents tell horror stories of entering homes that have a bad smell of pet urine or smoking. No seller wants to spend a few thousand dollars making repairs to a house you are about to sell. Agents understand that. 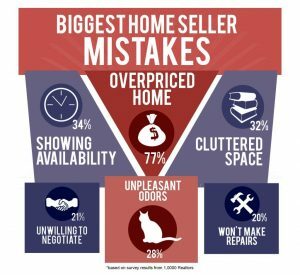 But they also understand that few buyers want to move into a house that needs a bunch of work done immediately upon moving in. Don’t be insulted by low offers. Buyers want to get the home for the best price and on the best terms, they can. Just like a sellers wants to sell for the best price on the best terms. It’s rare that either party walks away from a negotiation with everything they want. Motivated sellers understand this and are willing to negotiate. This one will most likely fall on your real estate agent. But knowing that bad photos in the MLS can be an impediment to the sale of your home, as a seller, it’s imperative that you demand great photography from your agent. The old adage will always hold true: “A picture is worth a thousand words”. Some people may be able to look past the dishes stacked up in the sink, but enough buyers won’t be able to look past the mess. Remember, buyers want to envision their things in your house. The more obstacles you put in the way, the harder time they have connecting with the home emotionally. Take the time every day to make sure everything is cleaned up and the home is in showing condition. You decided to list with your aunt or with your friend that just got in the business. You paid no attention to their experience or what they do to market a home. Definitely not the best idea! Don’t be scared to ask a real estate agent questions about why they are a better choice than anyone else you may be considering. Just like with any profession, there are good real estate agents and there are bad real estate agents.